A lot of house fires start in the kitchen. These days many new homes have a cooking range installed in the kitchen, and the oven is often a source of these fires. 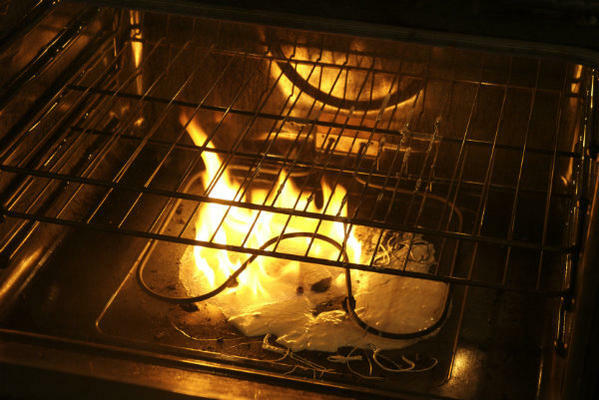 Why do ovens catch fire? Ovens can catch fire for various reasons. Sometimes the fat in food being cooked gets splattered around and catches fire. Sometimes the juicy liquids drip down to the bottom of oven and catch fire by contact with element. Sometimes we put something to cook in the oven and just forget about it! But whatever the reason, everyone should know how to deal with an oven that's caught fire. 1. Do not open the door of oven. Turn off the electricity supply to your oven and let the fire die out. Do Not open windows till the fire has died. 2. Sometimes it may be such a bad fire that you need to do something to douse it after turning off electricity. Using salt or baking soda on a fire helps in dousing it. 3. DO NOT use water or a water based solution to douse this fire. 4. If the fire refuses to die, call the fire brigade and leave your home. 5. If the fire dies, wait for 30-40 minutes before opening the oven door. To prevent oven fires, keep your oven clean and never leave it unattended when cooking food.